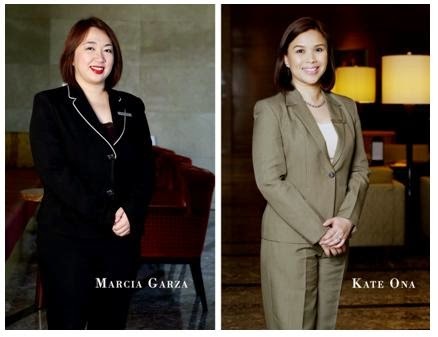 Marriott Hotel Manila announces the appointment of two key executives in the company as it continues to strengthen its market position in the events and hospitality industry with the upcoming Marriott Grand Ballroom and 228 additional rooms at the west wing. Marcia Garza joins the hotel’s team as the new Director of Human Resources, while Kate Ona assumes the newly created position of Director of Revenue Strategy. Amid the optimistic economic performance of the Philippines, especially in the tourism front, Marriott Hotel Manila’s expansion includes building the country's largest hotel convention center as well as increasing its room count to 570 Marriott Grand Ballroom is a strategic addition to the country’s event facilities as the Philippines prepares to host a series of prestigious international events between 2015 and 2017 . Next year, the country will host the Asia-Pacific Economic Cooperation meetings. The development includes the important task of recruiting more than 200 regular employees to deliver the hotel's renowned service. To handle the task of recruitment and training employees, as well as make sure the entire organization is able to surpass guest expectations, the hotel has chosen a former member of the Marriott International team, Marcia Garza, to lead the Human Resources Department. Marcia brings with her an invaluable practical understanding of the Marriott organization, having come from a 12-year stint in one of the group’s former hotels, Renaissance Makati. Prior to her new appointment, she was a senior HR manager of SMX Convention Center. Her knowledge of the Manila market, pre-opening experience, and cross-functional background in the hotel industry will support the hotel's success in implementing its development plan. She will also ensure that the hotel lives up to the brand's commitment to its employees. Marriott International is considered by Fortune magazine as among the 100 Best Companies to Work for (No. 57) in its 2014 list, among other recognitions for its corporate reputation. Meanwhile, Kate Ona has been promoted to the newly created position Director of Revenue Strategy from her former position of Director of Revenue Management. As the hotel adds more income-generating space, the post was created to expand the revenue discipline and thereby broaden the scope and analysis and strategic planning involved in this area. Kate is a pride of the company for implementing revenue strategies that made Marriott Hotel Manila among the hotel chain’s best performers in Southeast Asia. She will not only be responsible for maximizing revenues in Manila but will also take on oversight of future projects within the Philippines and continuing task forces throughout the region. The hotel is set to unveil the Marriott Grand Ballroom in the first quarter of next year. Meanwhile, the opening of the additional rooms will follow shortly. To know more about Marriott Hotel Manila, visit www.marriott.com/mnlap, or follow facebook.com/marriotthotelmanila and Twitter @marriottmanila.